The world No 59 cruised into the last 16 at the County Donegal resort thanks to a 5 and 4 win over Laytown and Bettystown’s Barbara Cooney and a now faces international team mate Sinead Sexton from Lahinch in Monday’s second round over the Old Tom Morris links. Holywood’s Jessica Carty turned in three under par after carding a birdie at the first and an eagle at the sixth en route to a 6 and 5 win over former Irish Close champion Karen Delaney from Carlow. The Island’s Gillian O’Leary lso secured a notable win against current international Jessica Ross from Donaghadee while Warrenpoint’s Tara Gribben beat Waterford Castle’s Katie Aherne 2 up thanks to an eagle at the par-five sixth and birdies at the 11th, 13th and 18th. Internationals Ciara Casey (Hermitage), Maria Dunne (Skerries), Chloe Ryan (Castletroy), Paula Grant (Lisburn), Niamh McSherry (Lurgan) and defending champion Mary Doyle (The Heath) also made it safely through the first round. In the Ita Wallace Plate, former Ladies Eurooean Tour professional Danielle McVeigh will play Portsalon’s Claire McGonagle in the first semi-final with the victor to play the winner of the clash between Lurgan’s Maeve Cummins and Castle Dargan’s Maeve Kelly. 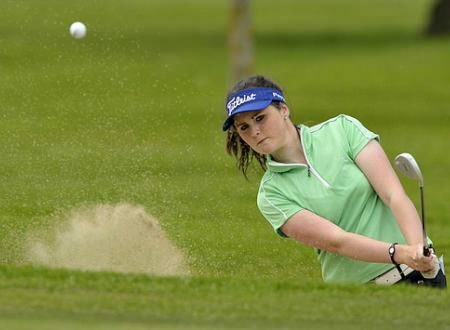 The Heath’s Mary Doyle remained on course to retain her Irish Women’s Close title at Rosapenna as Olivia Mehaffey continued her bid for a fourth title this season.